Indoor acoustics: what do they teach? What do they teach residential architects and designers about acoustics and noise? I mean inside noise, entertaining noise, party noise. When Reggie talks, people listen - if the acoustics are good. I walked into a kitchen and couldn't hear a thing. JoAnn and I went to shower at a wonderful 1920's bungalow. We headed for the kitchen. It was beautiful. They'd just finished a kitchen re-do that belongs in a magazine. It was big, and comfortable There 10 folks in there and room for 25. Inside though, I couldn't "hear" a female voice even when she stood right in front of me. I doubt it's a problem in ordinary family use. But it got me thinking. Professionals plan acoustics for theaters. Last night the Balzer Theater was a sanctuary. The conversation and Klimchak's music were delightful. But do acoustic engineers deal with houses? Do they teach acoustics in design school? The westside Sky Bar at 5 Seasons Brewing Company is spectacular but I can't take it inside. My children warn me about loud places. For them a loud place is likely a fun place. But they know how it affects me. I expect unpleasant noise in bars and restaurants but not in a house. So it made me think about our 4th party. There were more than 50 folks in there and yet I could hear. Was it planned or was it a fortunate accident? Was it the sloped ceiling, the stairs, the angles, the "L's?" Can you have this conversation with 40 folks in the room? I hope so. Of course I used the opportunity to visit the 1928(?) Grant Park Elementary School, now home to the Arts Exchange. 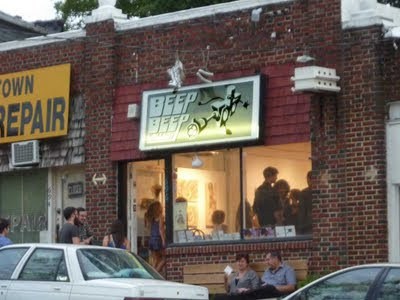 On Sunday night I went to a Court 13 film screening hosted by Burnaway, and Public Acts of Art, at the Art Exchange. Here are some event pictures, thanks to Josh Ente from Court 13 in New Orleans. Never seen the Grant Park School? It's next to the 1896 Atlanta Stockade. Never seen the Atlanta Stockade? 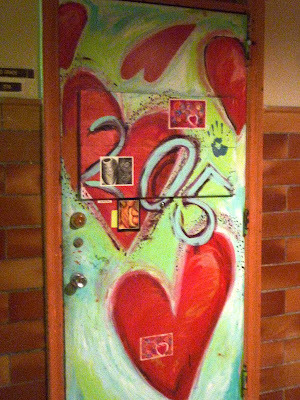 It all a bit too much for one post so I'll just show you the doors in the halls. It's the standard schoolhouse hall. But does this look 1930? If you click a picture you can make it bigger. The Paul Robeson Theater is at the south end. I walked all the way to the back, right up to Corrina to ask her, "Where's that new work your were talking about." She pointed back over my shoulder to this gate, nearly finished, bound for a north Atlanta Mansion. It's a one-of-a-kind organic "phantasmagorie." 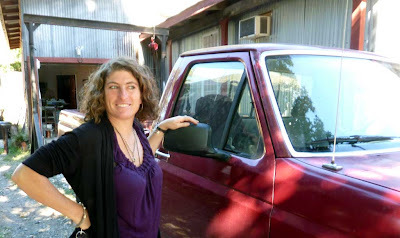 Corrina Sephora Mensoff opened her Goat Farm studio yesterday. Corrina is in red with the Men of Plaid. "I am a blacksmith, sculptor, metalsmith. I work in metal predominantly, however also mixed media installation and printmaking." "Happy wonder woman of welding with a pickup." 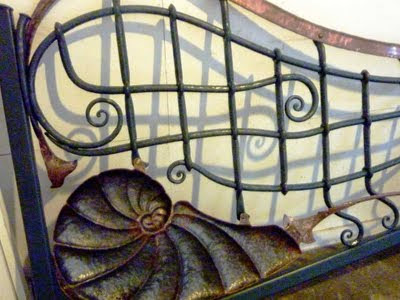 If you've been to the Atlanta Botanical Gardens, you've probably seen her elaborate "Sun Moon Nautilus Passage" gate. This is the new gate. Corrina displayed the work with drawings, renderings, prototypes and patterns. They give a sense of how this work get's done. Some readers will surely recognize these gate posts and dragons. The studio was clean, quiet, and calm last night. The delicate full size patterns barely hint at the noise, the heat, the mass, and the precision of Corrina's work. These sturdy tools can produce delicate work. If you aren't ready for your gate, you can try a candlestick. What a week: Art, Altitude, Sharpening, Turnstile and Window Dance, and "The Torch"
We had a fun week at Architecture Tourist Southern Command. 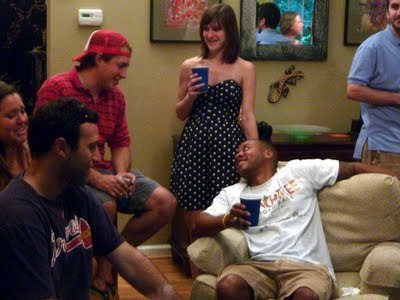 The July 4th party was a hard act to follow but follow it we did starting at the July 9th Ponce Crush. 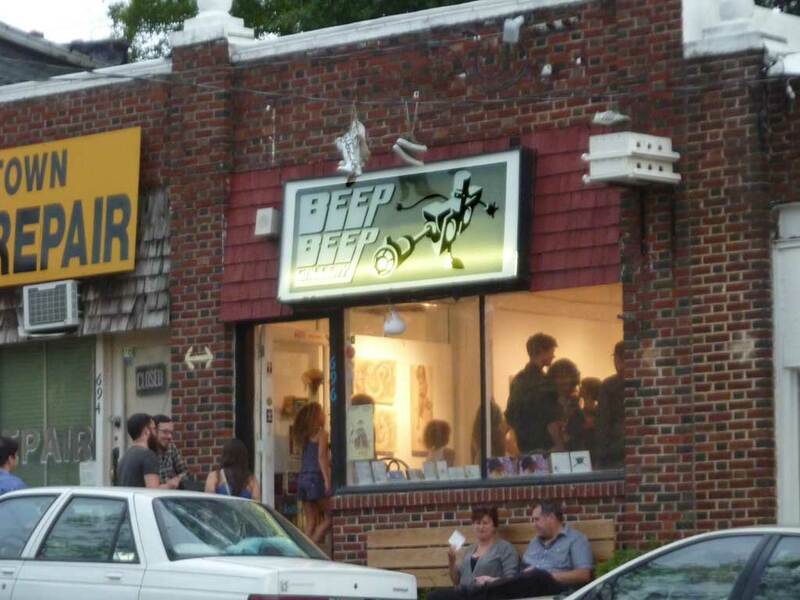 Beep Beep Gallery will celebrate it's 5th anniversary on August 6th, be there. After the show they'll party at the Highlands Inn Ballroom; ever been there? Congratulations to owners Mark Basehore and James McConnell. Was this a coincidence? The Crush featured 6 lady artist in 3 galleries. Bottom row: Marcy Starz (Beep Beep Gallery) , Patricia Patterson (Young Blood Gallery), Kelly McKernan (Beep Beep Gallery). I've been following a teardown at the highest point in Virginia Highlands. At 1037 feet above sea level it's one of the highest residential lots in the City. Two words: rooftop deck. I'll have more to say on this: it's high up; it's in the trees; it's special. It's a spec house at 1020 Bellevue. Check it out. It's getting it's warm cedar coat and will soon get it's stucco base and tower. If you see partners Brian Ahern or Jeff Darby, you might get a tour. The Morningside redo by architect Brad Heppner got its "white coat" of stucco. I asked Brad about it. He said, "Still some sharpening of the stucco profiles, but shaping up." I'd never thought of "sharpening" before. Imagine how sloppy it could look if the corners, the lines, and arches aren't perfect. Brian Ahern told me that many stucco craftsmen are from eastern Europe. glo ATL is performing Liquid Culture. In their words: "A physical installation series of 5 Utopia Stations in four Atlanta locations, over 15 days." In my words: Dance out in the open. The final performances: July 22-23 7:30-8:30 PM 15th & Peachtree. They performed at the Lindbergh MARTA station on July 14, Thursday evening. It's so easy to see, it's crazy, it's charming, it's kind of addictive to Architecture Tourists. Do check out their turnstile line dance. It's sure to become an Atlanta craze. On Friday, July 15 glo ATL performed in and around storefronts in Little 5 Points. It was odd and spooky even for L5P. Dancer and photographer at one of Never's Owls. When it's birthday season around here we bring in the Architecture Tourist pyro director. The crowd will accept nothing less. Hey, the week isn't over yet. I haven't even mentioned meeting the Dames Aflame at the Grand Opening of the Melvin Gallery at the Cotton Docks. Harry and the Potters headlined a WonderRoot show at the Magnetic Theater. I've known of this place for a long time. I've scouted for an event that would allow me to see inside. 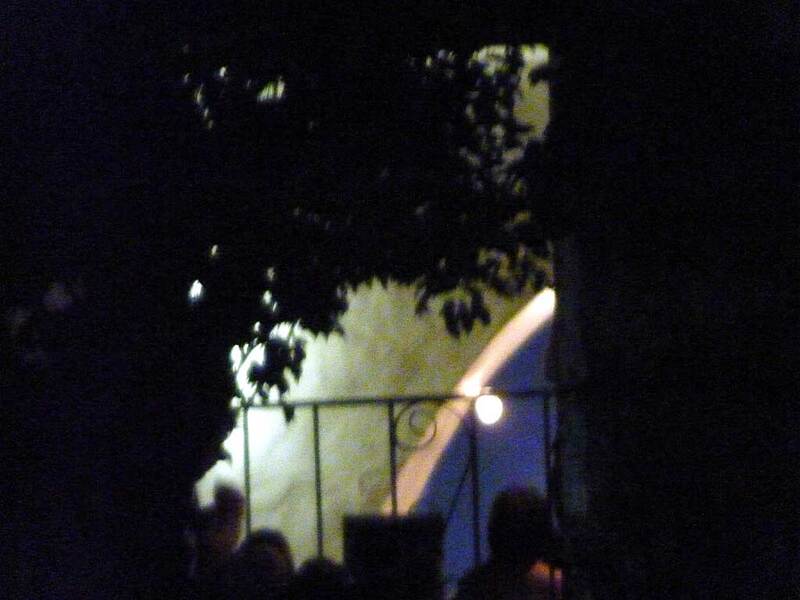 There I was on Sunday night: an ancient with the young rockers. When I caught this view through the door, I knew I'd done the right thing. It was a chance to learn more or at least forget less. It was St. Phillips A.M.E. Church and then Beardon A.M.E. Church on Wylie Street in Reynoldstown. It's deconsecrated. Now it's the Magnetic Theater and you can rent it from Kevin at Giant Sounds. You can have a meeting, a show, or a recording session. The arch and chancel, the altar rail remains. It's quite handsome. Sanctuary upstairs, Sunday school downstairs. From the porch looking northwest it's classic Wylie Street. Norfolk Southern Railway's Inman Yard is on the other side of the fence. Cabbagetown is to the left. The Edgewood neighborhood is to the right. Inman Park is across the tracks. Kevin showed me the Beardon A.M.E "book." The preface is a history of the St. Phillips A.M.E church." The cornerstone is almost entirely unreadable. It's in the basement out of the weather. Maybe a rubbing can bring out the details. The crepe myrtles are not the right planting here. They hide the fine facade and triple window. The tower wall features stone and shingles. It doesn't have a bad side. The windows are modest yet refined and sturdy. The stained glass windows: Click a picture to enlarge. This isn't the definitive way to present windows but here they are for the record. The windows are the same except for the cartouche if that is the right word. I started with the left window, the east window in the south wall and went clockwise. I hope to learn more. When you tour Reynoldstown, make sure to see this brick beauty on Wylie Street in Reynoldstown. This was Bill Harrison's office when he designed my renovation, and Dean Garden.